Reading and share top 9 famous quotes and sayings about Facts And Evidence by famous authors and people. Browse top 9 famous quotes and sayings about Facts And Evidence by most favorite authors. 1. "Intuition is the wisdom formed by feeling and instinct - a gift of knowing without reasoning... Belief is ignited by hope and supported by facts and evidence - it builds alignment and creates confidence. Belief is what sets energy in motion and creates the success that breeds more success." 2. "The reassuring smile was now useless. I was plastic. Everything was veiled. Objectivity, facts, hard information--these were things only in the outline stage. There was nothing tying anything together yet, so the mind built up a defense, and the evidence was restructured, and that was what I tried to do on that morning--to restructure the evidence so it made sense--and that is what I failed at." 3. "What should we think of someone who never admits error, never entertains doubt but adheres unflinchingly to the same ideas all his life, regardless of new evidence? Doubt and skepticism are signs of rationality. When we are too certain of our opinions, we run the risk of ignoring any evidence that conflicts with our views. It is doubt that shows we are still thinking, still willing to reexamine hardened beliefs when confronted with new facts and new evidence." 4. "Facts are stubborn things; and whatever may be our wishes, our inclinations, or the dictates of our passions, they cannot alter the state of facts and evidence." 5. 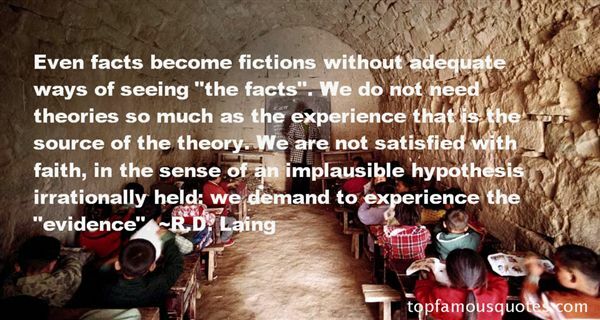 "Even facts become fictions without adequate ways of seeing "the facts". We do not need theories so much as the experience that is the source of the theory. We are not satisfied with faith, in the sense of an implausible hypothesis irrationally held: we demand to experience the "evidence"." 6. "A few months ago I told the American people I did not trade arms for hostages. My heart and my best intentions tell me that's true, but the facts and evidence tell me it is not." 7. "The witch-hunt narrative is a really popular story that goes like this: Lots of people were falsely convicted of child sexual abuse in the 1980s and early 1990s. And they were all victims of a witch-hunt. It just doesn't happen to line up with the facts when you actually look at the cases themselves in detail. But it's a really popular narrative — I think it's absolutely fair to say that's the conventional wisdom. It's what most people now think is the uncontested truth, and those cases had no basis in fact. And what 15 years of painstaking trial court research (says) is that that's not a very fair description of those cases, and in fact many of those cases had substantial evidence of abuse. The witch-hunt narrative is that these were all gross injustices to the defendant. In fact, what it looks like in retrospect is the injustices were much more often to children." 8. "And all of the scientific data, statistical facts and empirical evidence can't compete with the indefinable heart's desire. For if in the end, she loves you, and she chooses you…none of the rest of this will matter." 9. 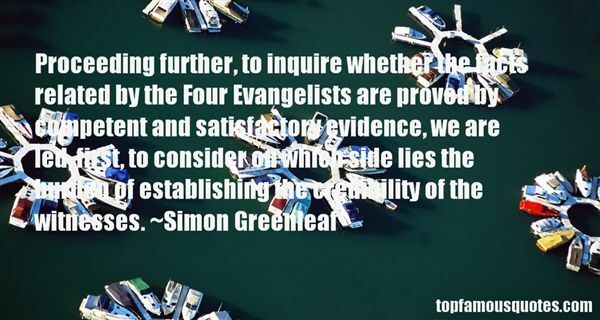 "Proceeding further, to inquire whether the facts related by the Four Evangelists are proved by competent and satisfactory evidence, we are led, first, to consider on which side lies the burden of establishing the credibility of the witnesses." People with family histories of alcoholism tend to have lower levels of endorphins- the endogenous morphine that is responsible for many of our pleasure responses- than do people genetically disinclined to alcoholism. Alcohol will slightly raise the endorphin level of people without the genetic basis for alcoholism; it will dramatically raise the endorphin level of people with that genetic basis. Specialists spend a lot of time formulating exotic hypotheses to account for substance abuse. Most experts point out, strong motivations for avoiding drugs; but there are also strong motivations for taking them. People who claim not to understand why anyone would get addicted to drugs are usually people who haven't tried them or who are genetically fairly invulnerable to them."